The Parkallen Community Garden is growing in the 2018 season and you are invited to our 5th annual AGM. When: Friday, May 25th, 2018, 6:30-7:30 p.m.
And Sundays mornings 8-10 a.m. 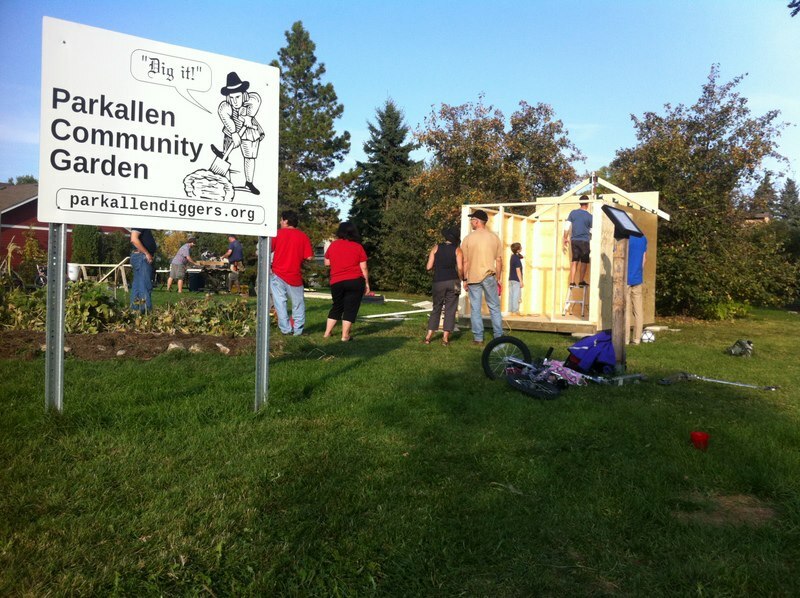 The Parkallen Community Garden has a new leader: Christine Watts. All ages and abilities are welcome to meet and garden with Christine at directed gardening bees on Saturdays, 2-4 p.m. and on Wednesday Evenings, 7-8 p.m.
As always, visitors are welcome anytime and self-directed gardening is encouraged. 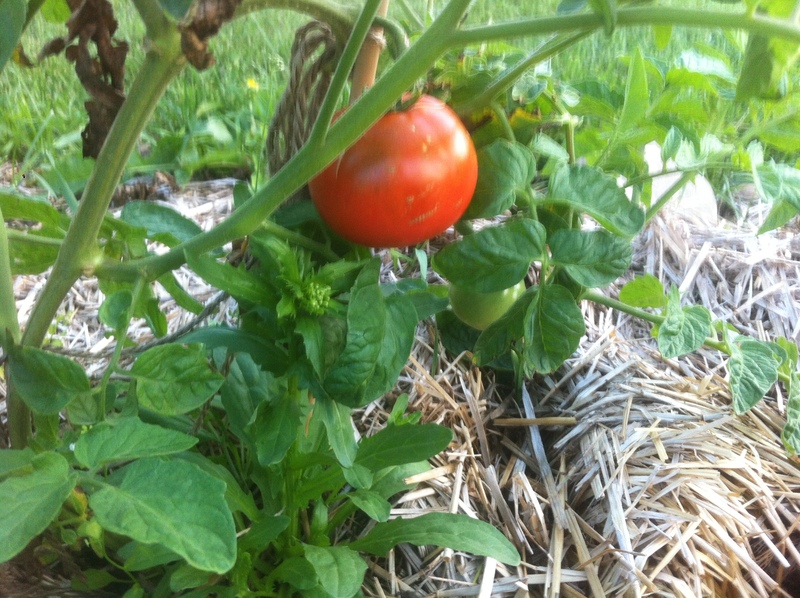 Pull some weeds, plant (and label) something, harvest a handful of something to munch on the spot or for your dinner. See what’s coming up. Looks for the cheery bulbs planted by the Brownies in 2015 and 2016. We’re still growing in 2017. Wildlife gardening means providing the conditions in your green space that are attractive to animals such as birds, butterflies, and bees. All animals need food, water, and a safe place to raise their young. Insects, which we need to pollinate our plants, and bats which pollinate and control pests, are not exceptions. 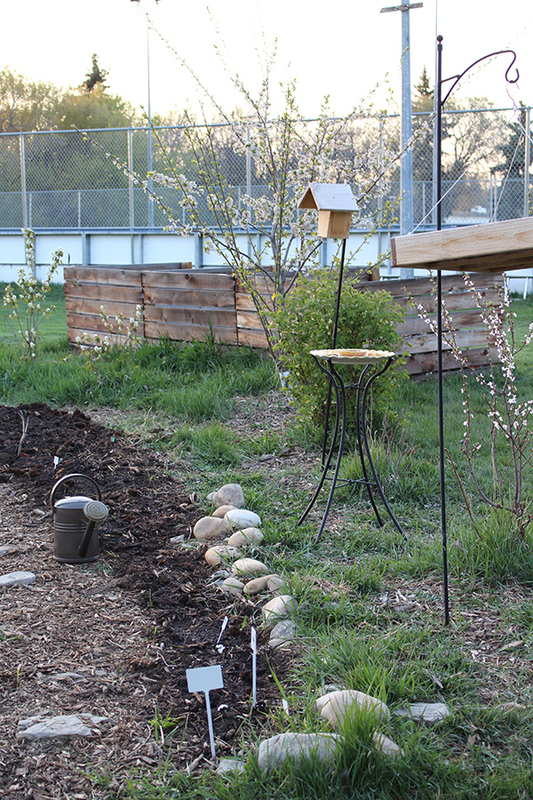 Over the past several years, the Parkallen Community Garden has been adding feeders and nesting boxes for beneficial animals. Above is a wren house (yet to be occupied), a watering station for birds and insects, and a large bird feeder with mess-free birdseed. Food + Shelter + Water = Wildlife Gardening. The Parkallen Community Garden neighbours our outdoor community hockey rink. 16 feet high on a lamp post that lights our rink in the winter, we’ve hung a bathouse. It’s been constructed especially for this location by a local bat enthusiast and conservationist, Robert Danner. Little Brown Bats (our local species) are mammals and need a safe place to nurse their newborn babies in the spring time. A bat house serves as a nursery for moms and pups. There is a roof over-head but no floor — they enter from below and hang on to the rough interior surface with their claws. They huddle together for warmth and companionship. Bats only occupy a bat house in the springtime. Bat colonies over-winter elsewhere. Little Brown Bats eat mosquitoes, among other insects. To answer some FAQ’s – No, the house doesn’t come with bats. After discovering the house, if they like it, local bats will move in next Spring or the Spring after that. Bats and people have been peacefully co-existing for all of human history, and bats have only recently developed a reputation for being scary and unclean. Little Brown Bats are extremely shy and would never attack humans or pets. They are wild animals though, and belong outside, not in our homes. Common sense tells us to never approach a sick or dead bat, and not to handle it’s feces. Learn more about bats in Alberta from Alberta Conservation. This is our owl house, which we hope will be attractive to a Saw Whet owl. 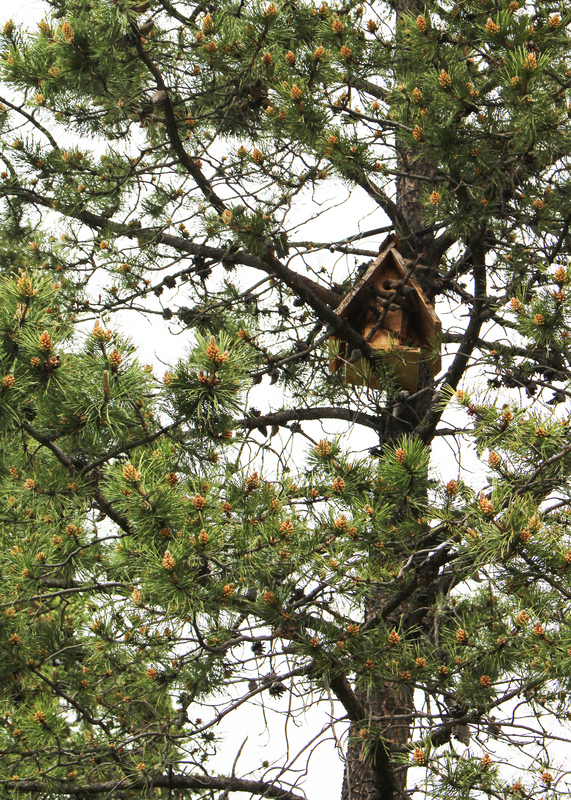 We’ve seen Great Horned owls in the neighbourhood, but they wouldn’t nest in a house like this. Great Horneds like the crotches of trees. Note that this nesting box has a large, owl-sized opening. If a local owl likes this home, she may lay her eggs in it next Spring. We’ve lined the inside with wood shavings. Thanks, Robert! And hung it as high as possible under the eaves of our Community League, facing South. It’s a warm, protected location with a fairly clear view and a good swoop zone. Thanks, Seth for installing it! We know that’s an unlikely an owl will use this home, but an owl house was high on a list of must-haves according to Parkallen School kids. You might like to see a baby saw whet owl on You-Tube. 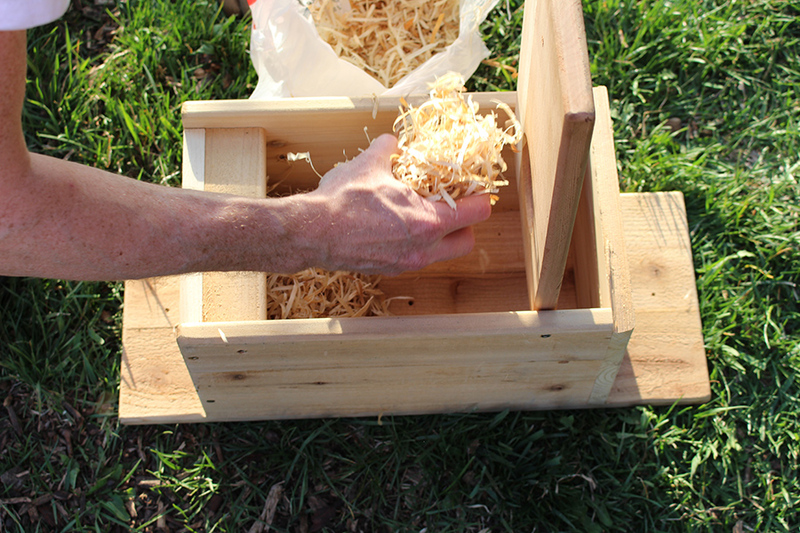 We’ve also created a nest box or bee hotel for wild bees. Unlike honeybees, wild bees are solitary. They don’t swarm or sting, they are most likely to flee or retreat from a human. They’re very safe and are, in a healthy ecosystem, all around us. A wild mother bee would occupy a single tube (like the hollow stalk of a flower) to hatch her babies in. She needs a shelter to house her young, who she fetches pollen for all Spring. Like the other nest boxes, this one would be inhabited only when the mothers are raising babies, and not throughout the year. It doesn’t come with bees — but if they like it, they’ll use it to keep their babies sheltered and safe. 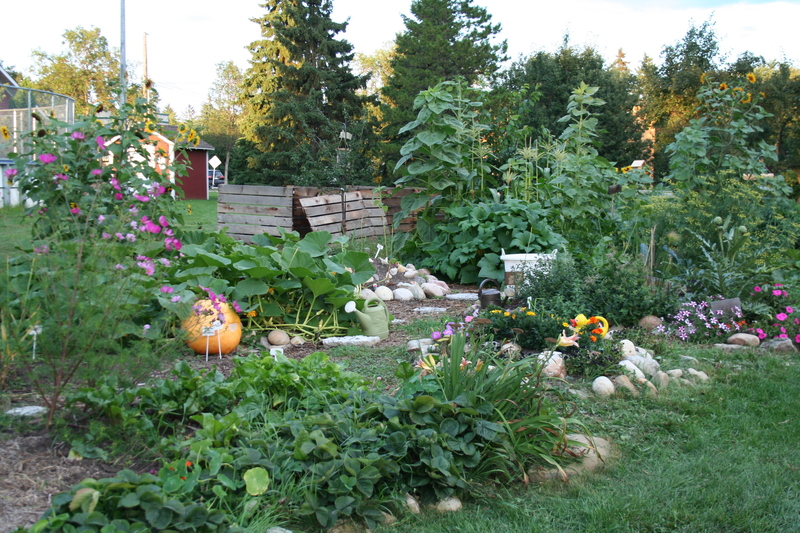 Our garden needs pollinators to make food for us. Diverse pollinators and a diverse, stable food-supply go hand in hand. 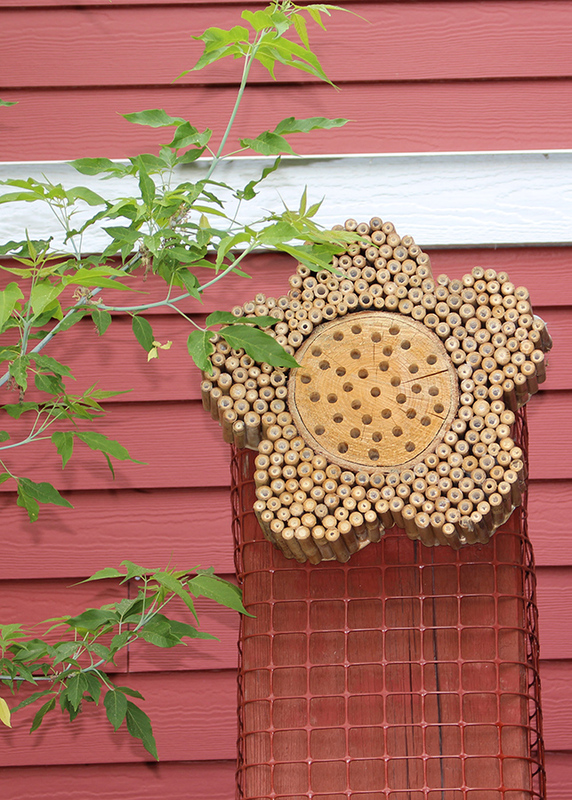 Learn more about building a bee hotel and about solitary bees from the National Geographic Society. 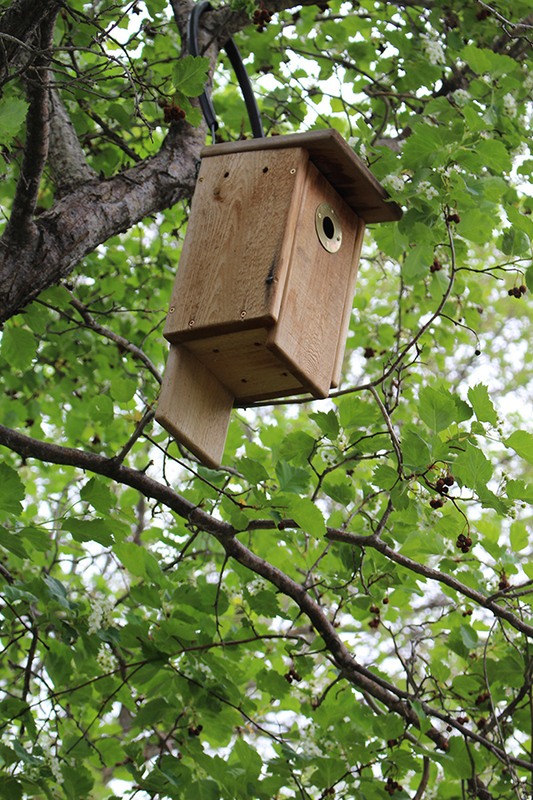 This nesting box may be a home for a native songbird, such as a a wren or a chickadee. Sparrows (a non-native species) are very aggressive nesters and good at crowding out native songbird species in Edmonton. Sparrows are like the dandelions of the bird world. This birdhouse has a restrictor over the hole. The hole-size restrictor will hopefully make the nesting box unattractive to sparrows, and perfect for chickadees or wrens. Native songbird species could really use a leg-up in YEG. 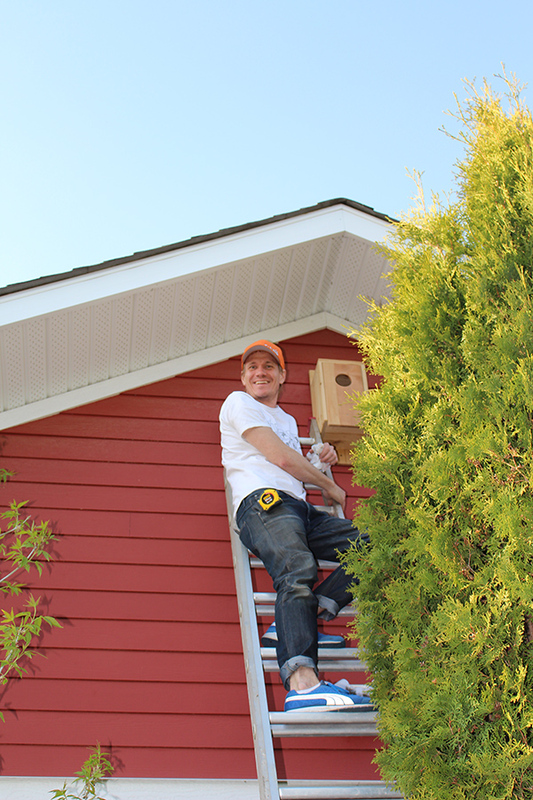 When you’re building or buying a birdhouse or nesting box in Edmonton, remember, the hole-size matters. Do some research to attract the right bird to your yard. 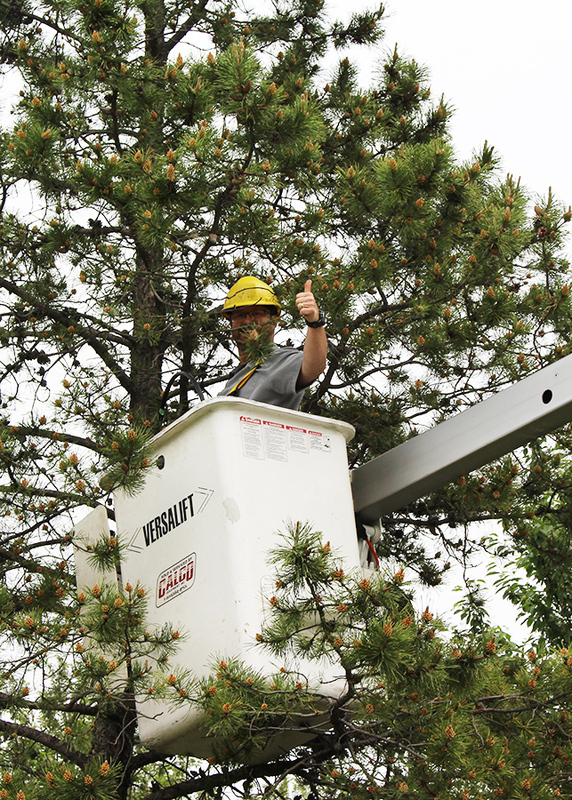 Above is another nesting box for a native songbird hung high in a pine tree at the Parkallen Community Garden. 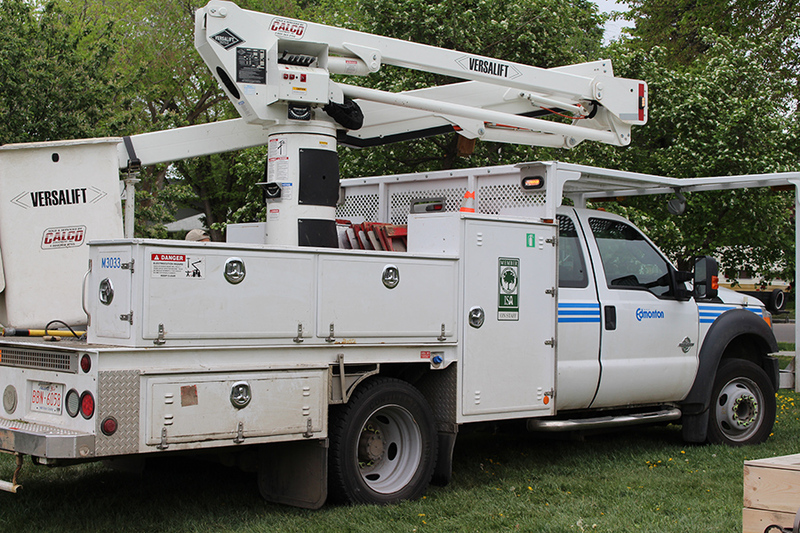 Thanks to all the Parkallen Community Gardeners who helped with the installations and especially to Brent Flesher (above) who will continue to monitor the nesting boxes. Thanks to the World Wild Life Fund for purchasing the nesting boxes as part of a Green CommUnity Award to Parkallen School. Thanks to Linda and Kathy at Parkallen School for their help administering the grant money. Thanks to the Parkallen Community League for supporting these projects in our community, and especially Anne Pratt for leading our community consultation. 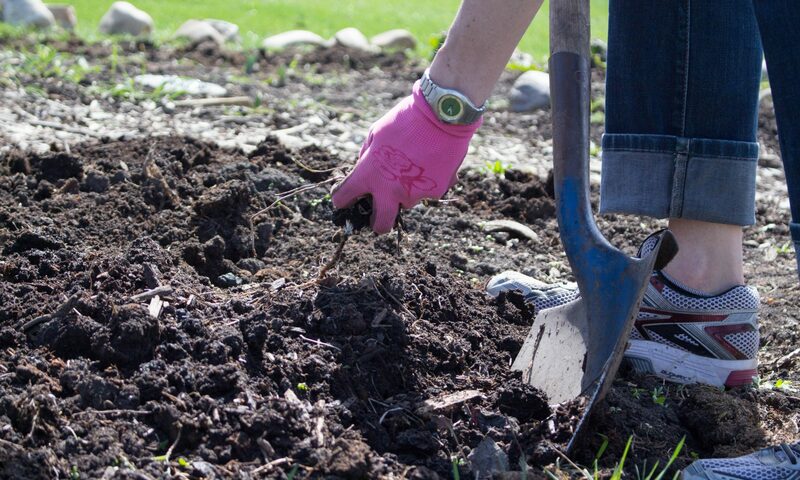 These wildlife gardening projects and this blog post were created by Marlene Wurfel, Parkallen Community Garden Director. 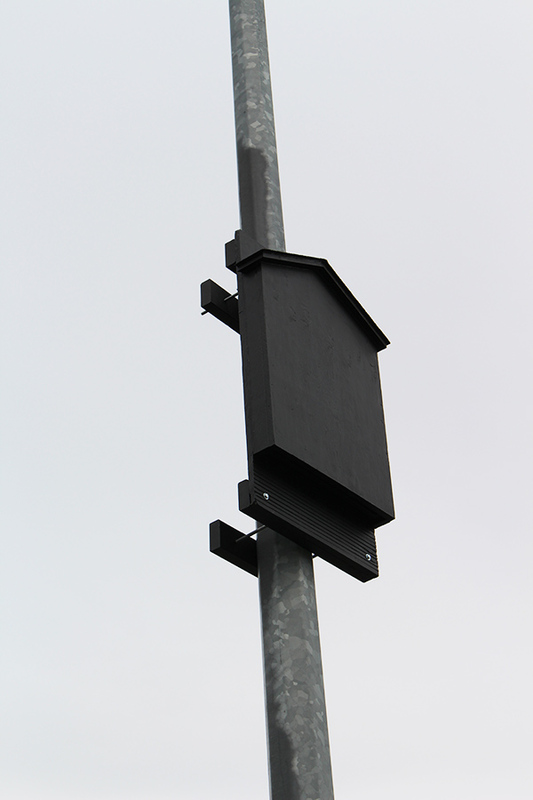 These nestboxes will not save the environment and the species they are meant to help out. But to build, install and maintain these nesting boxes for wild wings, I’ve learned so much about what wildlife needs in our urban landscape. It’s my hope that these projects will continue to teach Edmontonians about what our urban wildlife needs to survive and thrive. 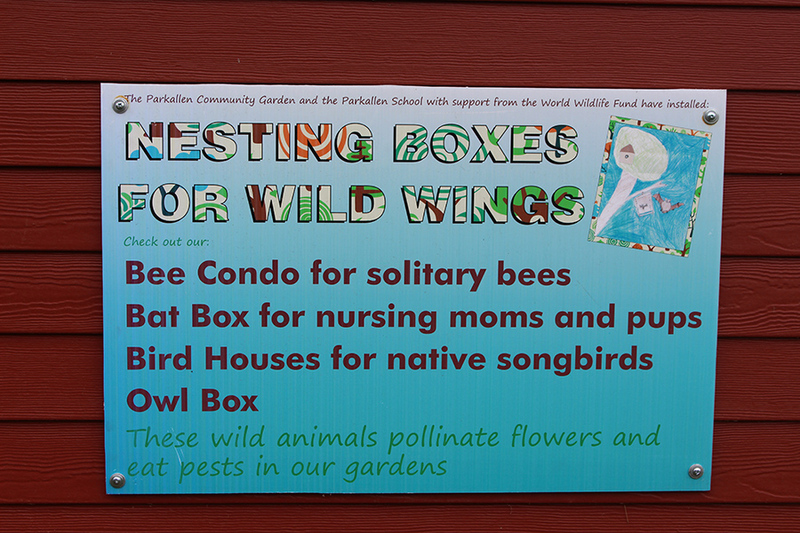 Drop by the Parkallen Community Garden where visitors are welcome any time to see our “Nesting Boxes for Wild Wings” projects. 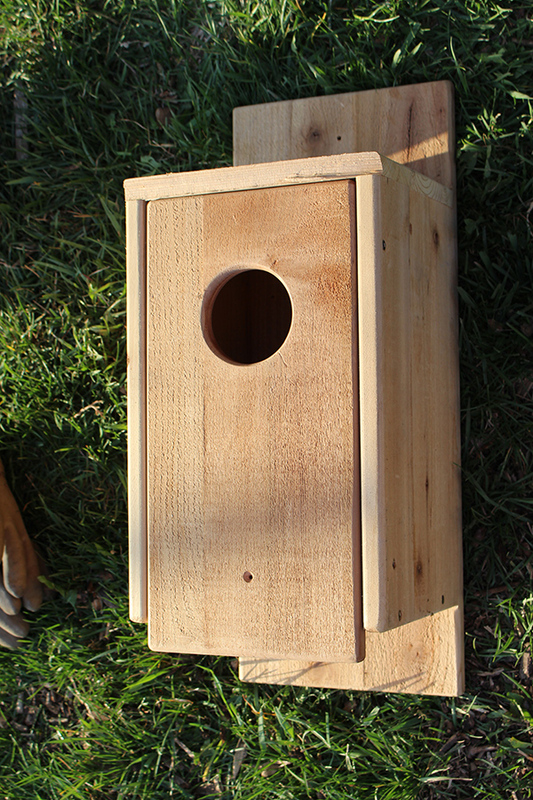 Check out our bee condo for solitary bees, bat box for nursing moms and pups, owl box and bird houses for native songbirds. Isn’t it gorgeous? I think so. It’s a dry fall though, so remember to lug a watering can full of water from the rain barrels to our thirsty veggies when you can. The rain barrels are behind the shed against the hall. 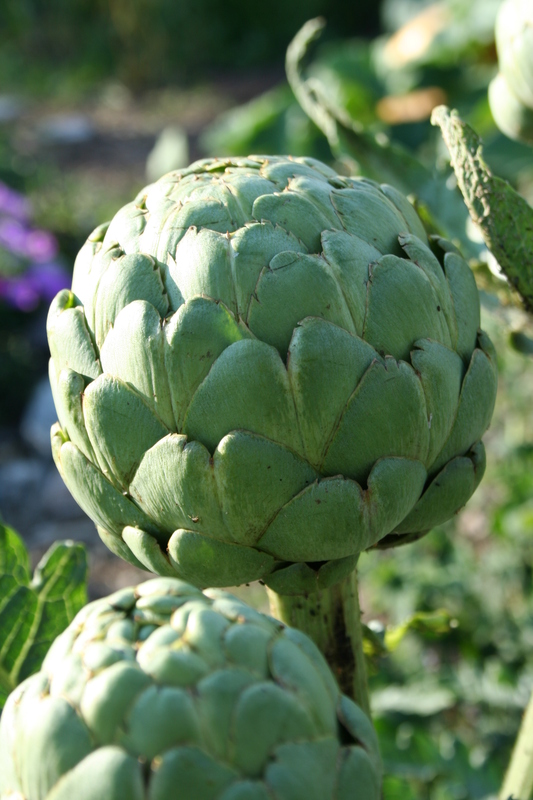 Also, if you see a nice big artichoke, please take it home and introduce it to some melted butter. 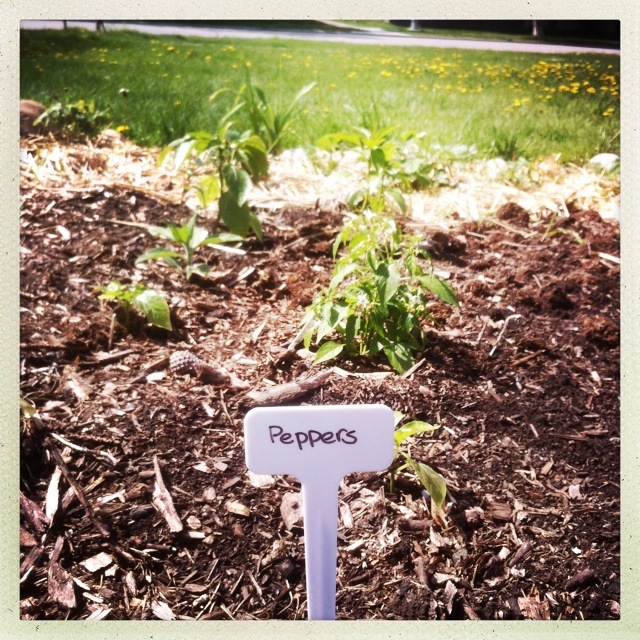 The Parkallen Community Garden is thriving this growing season and there are lots of yummy things to discover there. 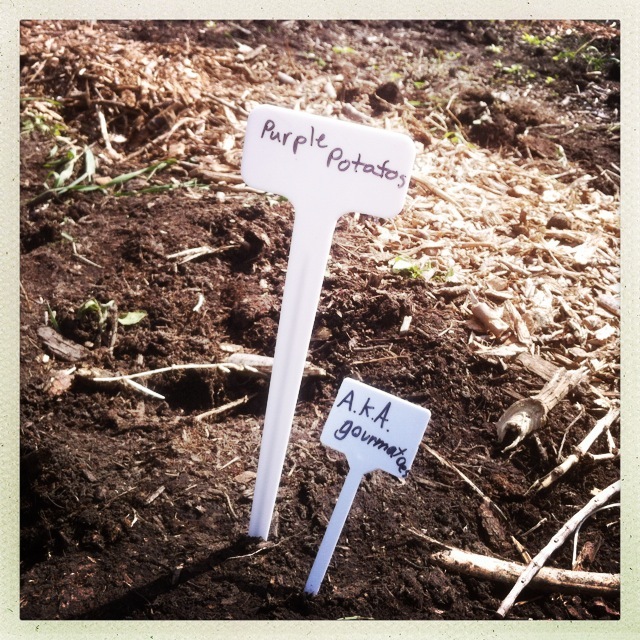 We are in maintenance and munch mode — meaning the garden needs weeding and the early crops are ready for some harvesting, e.g. a ripe tomato, some fennel, parsley and more are ready for your salad bowls. Making a cake? Harvest some violets from our edible flower spiral to decorate it. Two things that need doing asap is the garlic scapes should be cut. The energy of the plant should be going into producing a bulb underground, not a flower above ground, so we need to cut off the stems that are about to flower on top, leaving the bulb and leaves in place. The good news is that scapes are garlicky and delicious. 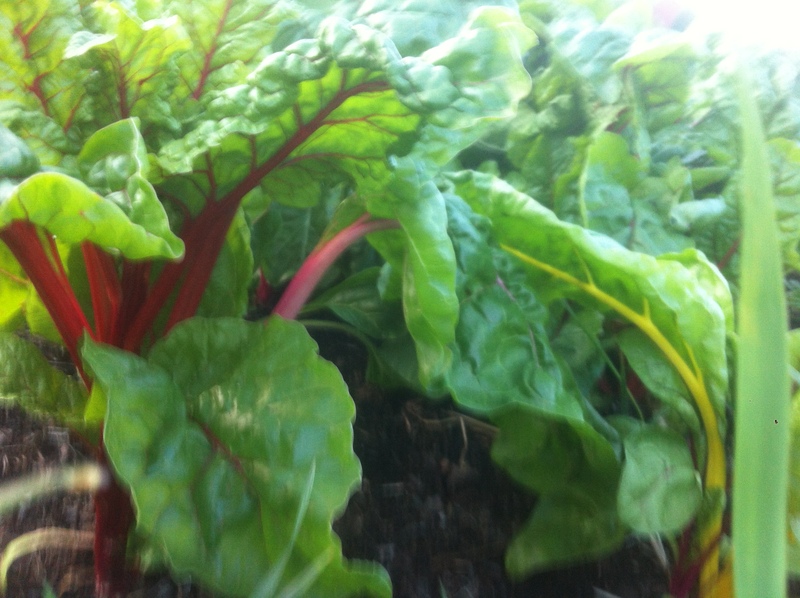 So go harvest a few for your soups or what have you. 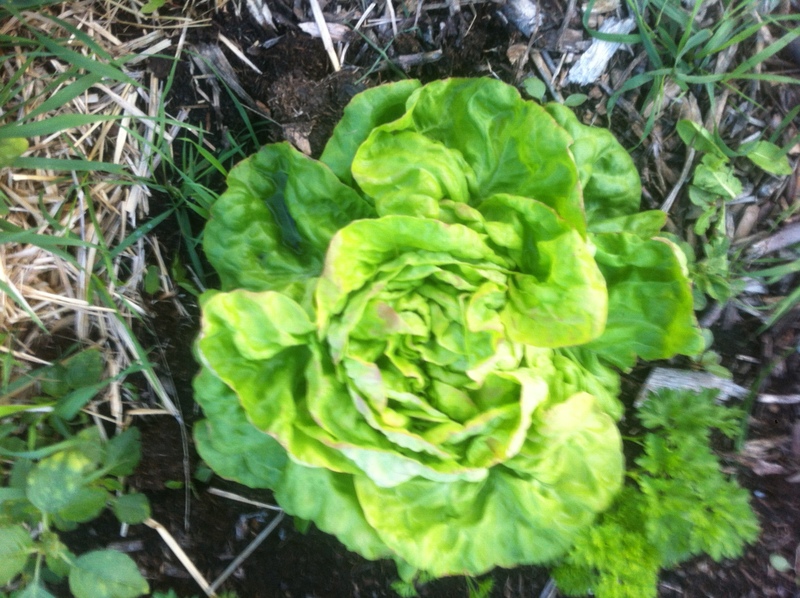 Also, the lettuce looks done and like it should be pulled out and replanted with another row or two of greens. So if you’re at the garden, look in the little house by herb spiral for seeds and go ahead and plant a new row of something wherever you can find space. If you’re one of the gardeners who has volunteered to lead a maintenance bee, please let me know what date/time you’d like and I’ll let the group know. 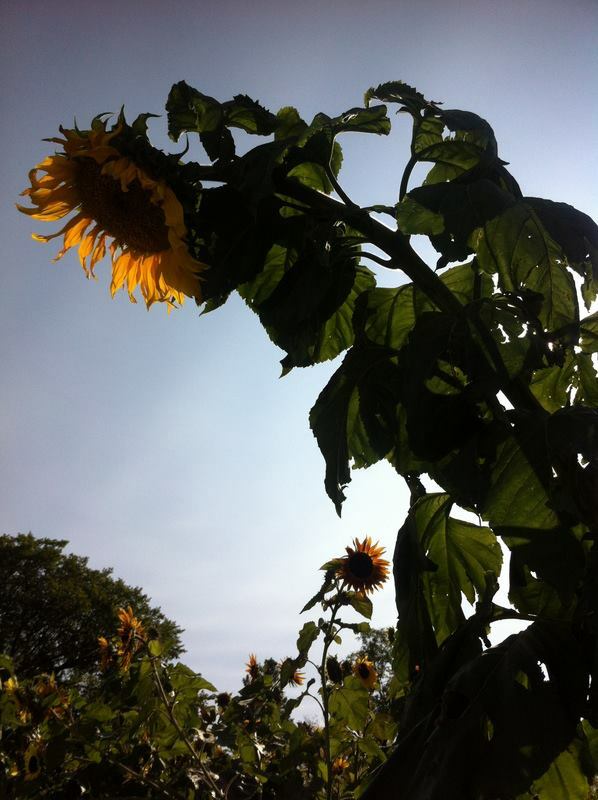 Fri, May 30th, 2014 at 10 a.m.: 5 SENSES GARDEN & EDIBLE FLOWER SPIRAL – All Ages Welcome. Have you noticed the “Schedule” page on this blog? Let me know if you have any suggestions. I’ve also added a “How It Works” page. Questions? Comments? Concerns? Let me know! Shedtemberfest was productive beyond what we dared hope! Even though we didn’t quite manage to finish the shed itself, we got the foundation, frame, and walls in place and the roof mostly done. In addition, thanks to the dozens of volunteers who showed up we were able to build some large compost bins, big enough to hold all of the autumn garden wastes and more besides. All this in a little over five hours total work. Incidentally, we welcome any and all help with finishing the work over the next few weeks before the snow flies (yes, I said it). We are considering having a second work bee to side and roof the shed, and perhaps we can add the door and lock while we’re at it. The pictures below sum up the outcomes of the day, although they can’t capture the magic of seeing so many former strangers come together to work for a common goal. Personally, I think the memory will help keep me warm in the winter! Thanks to all our lovely volunteers who cut, nailed, carried, dug, leveled, screwed, measured, barbecued, babysat, and served the beer. You guys rock! The shed as it stood late in the afternoon. 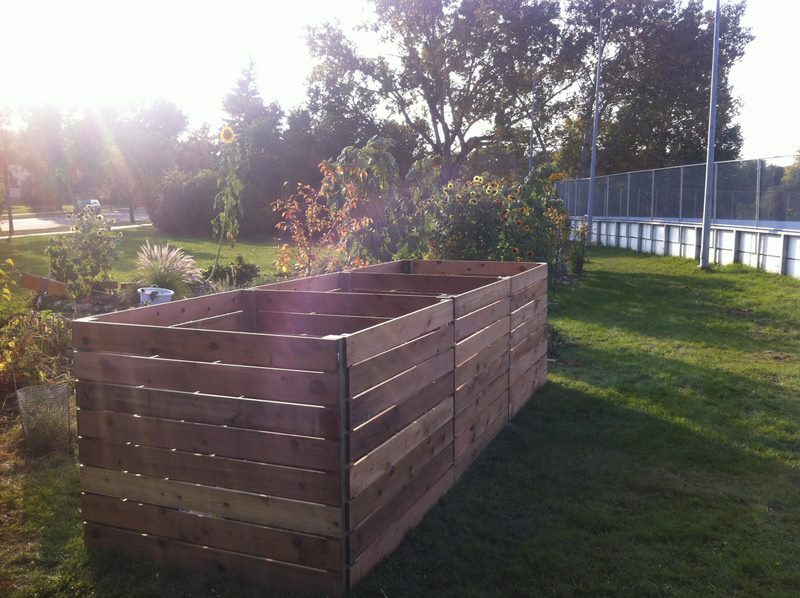 The composters are complete and ready for the fall’s harvest. It was this kind of day. Our garden is so lush and productive. 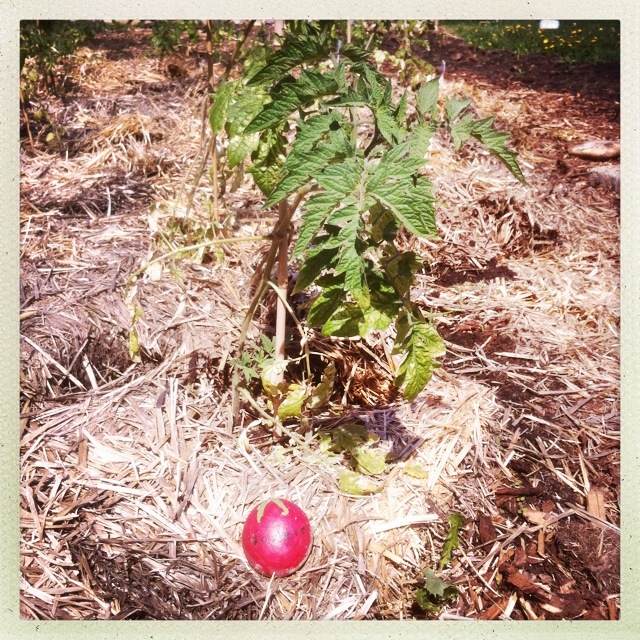 It is gorgeous to look at, tasty to harvest from, and so very easy to hand pull weeds out of the loamy soil in which the edible vegetables we planted are thriving. As you’ve probably heard, we’ve caught the eye of some granting and awards panels who will be touring our garden this week on Wednesday and Friday. We had a hearty work bee tonight during which we fought back some vegetation off the pathways, trimmed the grass around the garden, leveled our mulch and compost piles, and planted a beautiful apple tree with 5 zone hardy branches grafted on it, a plum, and a beaked hazelnut shrub. What a productive evening. 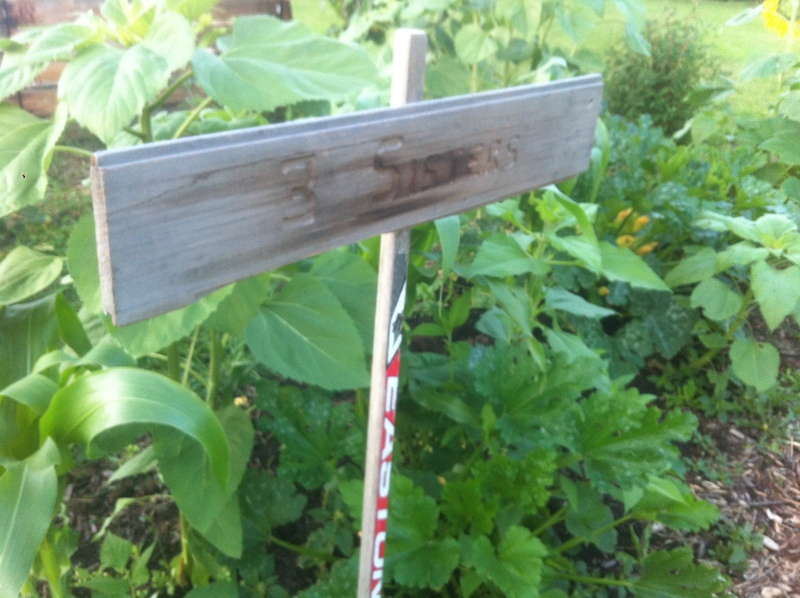 We also slapped several thousand mosquitoes, so if you visit the garden, please wear bug protection. All that rain has the mosquitoes thriving too. Eat something: just now there is kale, basil, oregano, chard, lettuce, sugar snap peas, spinach, baby carrots and lots and lots of beets. Eat fresh veggies on the spot or take them home to process. Fill your belly, fill your freezer! As always, e-mail sustainability@parkallen.ca to join us or with your good ideas.